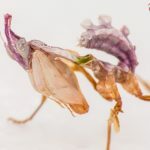 Idolomantis diabolica, commonly known as the devil’s flower mantis or giant devil’s flower mantis, is one of the largest species of praying mantis, possibly the largest that mimics flowers. It is the only species classified under the genus Idolomantis. Idolomantis diabolica is a large mantis of the family Empusidae. Females grow to be about 13cm in length and males to about 10cm. They are native to Ethiopia, Kenya, Malawi, Somalia, Tanzania, South Sudan and Uganda. Its threat display is magnificently colored, with red, white, blue, purple and black.